Vaaranam Aayiram (lit. Thousand Elephants) is a 2008 Indian Tamil-language musical film written and directed by Gautham Vasudev Menon. Suriya plays dual lead roles, with Divya Spandana, Sameera Reddy and Simran. The film had been under production since late 2006, and was released worldwide on 14 November 2008. It was dubbed and released in Telugu as Surya s/o Krishnan and in hindi as Suriya Ka Yaarana released in 2018 on Rishtey cineplex. The film illustrates the theme of how a father often came across his son’s life as a hero and inspiration, whose death was deeply mourned in the end. As a tribute to the father of the director, the film opened in several countries with critical acclaim. The film was produced by Venu Ravichandran and has musical score by Harris Jayaraj, making Vaaranam Aayiram his final project with Gautham Menon before the formal break-up of their partnership, which was eventually resumed 7 years later, in Yennai Arindhaal (2015). It won many awards including the National Film Award for Best Feature Film in Tamil. 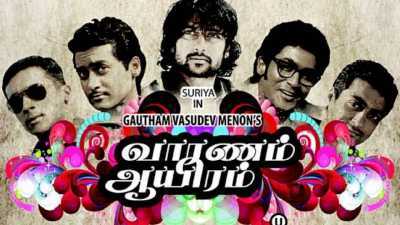 The film was also a commercial success, eventually becoming the biggest hit in Suriya’s career at that time.